Check Out Our Bundles ! LittleOne is a faithful software emulation of one of the most legendary and appreciated hardware analog synthesizers, compact in design but also extremely powerful and expressive. Perfection is not of this world. In nature, due to its inherent complexity (and beauty), everything is unpredictable, seemingly - for us - out of control. This makes things so special. This is true for everything, also for musical instruments. Based on analog electronics components, an analog synthesizer brings within itself all the imperfections of this technology. This is why it sounds so warm and rich. LittleOne synthesizer is entirely built upon this concept. The adoption of the Advanced Component Simulation (ACS) approach ensures that every component inside LittleOne is simulated preserving its original analogue hardware architecture and physical properties - including its own micro-imperfections and unique, time-varying instabilities. This means that - playing the same note twice - LittleOne will never produce exactly the same sound, not in a million years or more. Just as nature teaches us. In addition, it is also possible to modify the electrical tolerances for each of the analogue components used inside the synthesizer. Choosing stable components will mimic a modern manufacturing process, while choosing unstable components will take you back in time, and everything inside LittleOne will behave as it was manufactured in the 1970s, making it even bolder and meaner. This high-end approach assures brilliance, genuineness and depth to the sound. Audio demo made using exclusively LittleOne version 3.0. No external processing is used. Audio demo made using exclusively LittleOne version 3.0. No external processing is used. All presets are from Analog Freegures soundbank. Audio demo made using exclusively LittleOne version 3.0. No external processing is used. All presets are from 220V soundbank. Audio demo made using exclusively LittleOne version 3.0. No external processing is used. 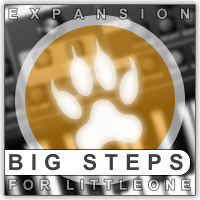 All presets are from Big Steps expansion. Audio demo made using exclusively LittleOne version 3.0. No external processing is used. All presets are from Tension Peaks expansion. Audio demo made using exclusively LittleOne version 3.0. No external processing is used. 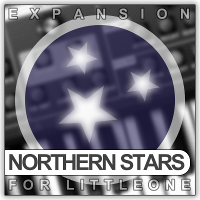 All presets are from Northern Stars expansion. Audio demo made using exclusively LittleOne version 3.0. No external processing is used. 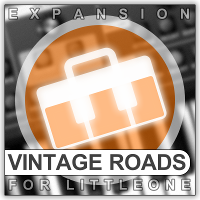 All presets are from Vintage Roads expansion. Audio demo made using exclusively LittleOne version 3.0. No external processing is used. All presets are from Electro Punks expansion. Audio demo made using exclusively LittleOne version 3.0. No external processing is used. All presets are from Stage Drawers expansion. Audio demo made using exclusively LittleOne version 3.0. No external processing is used. 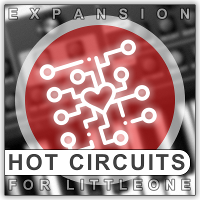 All presets are from Hot Circuits expansion. The Whole is definitively the best choice for hard-core synthesists : it's the complete set of all commercial expansions released by Xhun Audio for LittleOne synthesizer. This huge collection includes all the presets from the following commercial expansions : Big Steps , Tension Peaks , Northern Stars , Vintage Roads , Electro Punks , Stage Drawers , Hot Circuits . 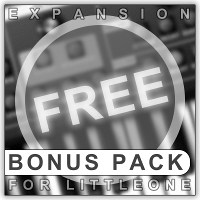 Bonus Pack is a selection of presets carefully chosen from all the commercial expansions released by Xhun Audio for LittleOne synthesizer. More and more presets will be added over time among with the release of new commercial expansions. The entire library can be downloaded for free. As for all the other expansions, it is compatible with LittleOne version 3.0 or above. Big Steps is a collection of ready-to-use sequences and phrases, covering a wide variety of musical styles : Techno/Trance, Electronica, 70's and 80's Disco, 90's Dance, Ambient and more. Use the included Sequences and the Trancegate patterns for studio compositions or live performances, or just use the presets as standard patches, adding an invasion of sounds to LittleOne's arsenal. 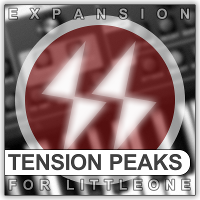 Tension Peaks is a collection of presets covering the loud world of EDM (Electronic Dance Music), Techno, Trance, IDM (Industrial Dance Music), Jungle, Hip-Hop and Experimental. Some of the presets also make extensive use of LittleOne's included Sequencer and Trancegate units. Are you ready for your next EDM hit ? Just rise the BPM and pump-up the volume ! Northern Stars is a collection of beautiful, evocative presets that will take you to a fantastic journey into alien worlds, endless canyons, distant stars. Explore virtual landscapes and lose yourself in the purity of this sounds. 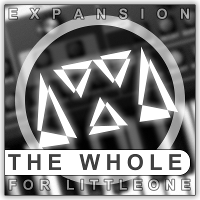 This expansion for LittleOne is simply the ideal companion for Classical, Ambient, Soundtrack, Videogame and Film Score composers. Vintage Roads is your pass for an amazing time travel. A collection of presets from iconic synthesizers that simply made the history in the passed decades (1970s and 1980s) are here at your fingertips. A valued tribute to that legendary analogue gears and also a memento of how powerful and versatile both LittleOne synthesizer and the embedded effects units could be. Electro Punks is a collection of raw, distorted, acid, experimental electronic presets. 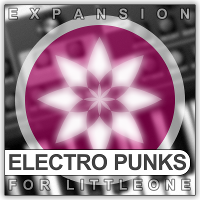 This soundset will bring all the powerful, extreme and iconic sound of an aged, modular, circuit bent, (also sequencer driven) analogue synthesis system without leaving the comfortable, easy to use interface of LittleOne synthesizer. Built exclusively for natural-born Punks of all ages ! 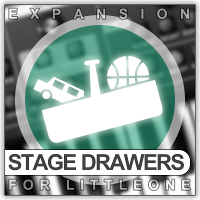 Stage Drawers gives to you a quick access to a world of ideas for both studio compositions or live scenarios. This smart library includes a collection of ready to use multi genre patches, sequences, sound effects. Ran out of ideas ? Recover your inspiration by directly using the presets included in this collection or just slightly modify them and open new sound designing horizons. 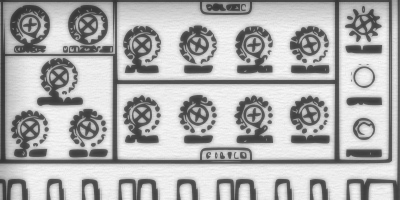 Hot Circuits represents the third of a series, a spiritual successor to Electro Punks and Tension Peaks expansions. As for the previous chapters, Electronic, Alternative, EDM lovers will find this presets and sequences collection extremely useful and versatile while its multiform nature will catch everyone else, making it a reference also for Film soundtracks and Ambient music composers. ¹ = Use of trademarks is only meant as a reference to clarify the instruments whose sound was modelled after and doesn't imply any endorsement.